I've been dealing with a lot of personal grief these days. This was the first series of holidays without someone that was real dear to me. I started looking for something to cling to in my grief so I wouldn't drown in my hurting. Then I remembered the recipe for anointing oil. Anointing someone with oil is one of the sacred spaces I get invited into periodically. Every time I anoint someone with oil I feel like I've stumbled onto holy ground. We see this practice all throughout the Old and New Testament of the Bible. People where anointed with oil for a variety of reasons. Kings where anointed. Priests were anointed. 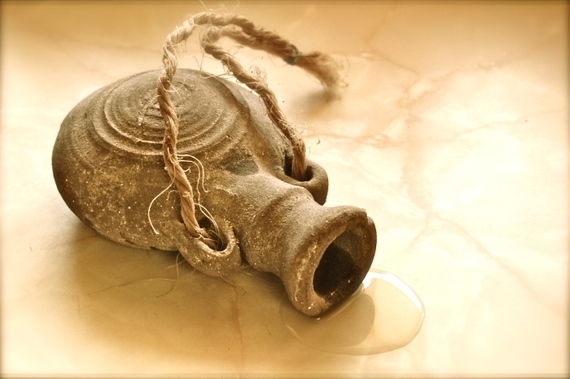 If a prophet was commissioned to speak to the ills of a nation or if someone was sick they would be anointed with oil. I think it is one of the most special things we can do for one another. Anointing reminds us of the importance of the intimacy of touch. It confirms and affirms those being anointed with oil. I think it's a sacred act of love that cuts through the staid ritual of just going through the motions of faith. It's amazing what a little oil, the laying on of hands, and a warm word can do for a person. We are given the exact recipe for the oil used for anointing in Ex. 30:23,24. You use some myrrh, aromatic sugar cane called calamus; two kinds of cinnamon and olive oil. It's interesting to note all of these ingredients have something in common. All of these ingredient's sweetness and usefulness is extracted by causing suffering. To harvest myrrh a tree is pierced and resin is bleed, baked in the sun to harden and then it's crushed. The cane's sweetness in taste and in smell comes from a process of burning away the useless leaves, cutting it at the base of the stalk and pounding the flesh until it releases it's sugars. Cinnamon is grown by a process of cutting the tree down in its prime and burying it in the soil in order for more shoots to produce. And olive oil is derived from pounding and pressing olives until it's juices are released. God could have chosen any types of herbs or flowers to make His oil but chose only those things that give off fragrances through piercing, bleeding, cutting, grinding, pounding and burying. Could it be God is trying to teach us something about Jesus and His way? Could it be God grieves our hurting, that He hates the tears we cry, the heartache we endure, but allows it to happen because He knows something about the beauty inside us? If allowed our grief can bring something special out of us. That broken relationship that's been keeping you up at night can bring something glorious out of you. The times of doubt, disappointment, or absolute horror you have been dealing with can bring something beautiful, something sweet, and something for sacred use out of you. If we embrace the sacred purposefulness we all have been given our suffering can have profound meaning. One drop of oil, one intimate touch, one warm word of affirmation can lend itself to one really important idea, which is this: If we allow it, God can make our messes meaningful. And we reaffirm this truth over and over again with the oil of anointing.